CHICAGO, IL, September 29, 2018 — Everywhere Wireless (EW) and the Entrepreneurs' Organization (EO) proudly announce a once-in-a-lifetime chance for enterprising students; A Celebration of Entrepreneurship: EO Chicago's Student Entrepreneur Awards. The event, aimed at undergraduate and graduate students, provides a platform on which to present their company in front of hundreds of entrepreneurs and a panel of celebrity judges. Student entrepreneurs operating a company for a minimum of 6 months and having generated at least $500 in revenue are encouraged to apply. This event could be the “big break” that turns a great idea into a great business. All applicants will receive feedback and the finalist will compete at the national event, along with winning a $10,000 cash prize to invest into his/her business. To learn more about this amazing opportunity and apply, visit the EO Global Student Entrepreneur Awards website; gsea.org/apply. The Chicago Chapter of EO will host the Chicago competition this year at The Dalcy at 302 North Green Street, in the Fulton Market District of the West Loop, on November 13, 2018, from 4:00 pm until 11:00 pm. The event will feature an inspirational presentation from the world record holder for completing the most Ironman competitions, the Iron Cowboy, James Lawrence. There will be opportunity at mentorship and an unparalleled chance at networking with the most significant gathering of Chicago entrepreneurs in recent years. The panel of Judges/Speakers consists of Michael Golden of @properties, Rob Katz with the Boka Restaurant Group, Max Temkin of Cards Against Humanity, Chris Ruder from Spikeball, Professor Esther Barron of Northwestern University, John Deblasio from Bootstrap Capital, Rich Labriola of Stan's Donuts, Andy Gloor from Sterling Bay, and Betsy Ziegler from 1871. The event promises to be a networking opportunity unlike any other, in a city known for its enthusiastic and industrious attitude and personalities. For more information on how to attend, compete, participate, or sponsor this amazing event, click here. 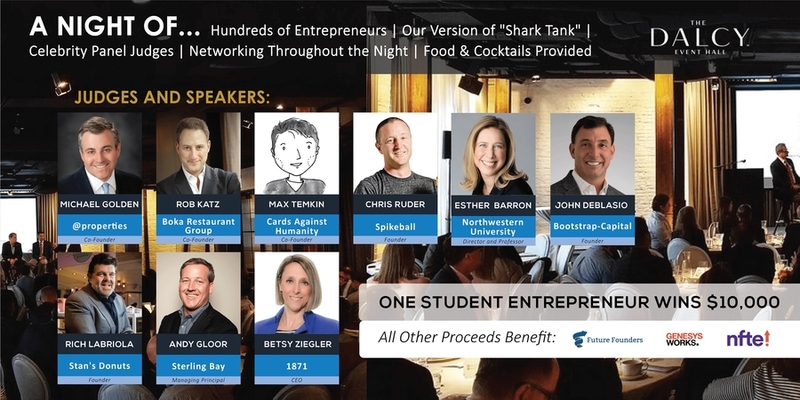 From the field of applicants, 4 finalists will be selected to present their business to the audience and judges in a format similar to the popular show “Shark Tank.” Following the presentations, one winner will be chosen and they will receive $10,000 and 6 mentoring sessions with EO Chicago. The winner of this qualifying competition will also receive invitations to EO Chicago's exclusive learning events and sent to compete at the USA Nationals in Denver, CO on January 10-11, 2019, with a chance to compete at the GSEA finals in Macau, China on April 11-12, 2019 and a shot at a prize package of $20,000 cash and total value of more than $400,000! Founded in 1998 by Saint Louis University, the GSEA is now an Entrepreneurs' Organization program. The Global Student Entrepreneur Awards (GSEA) is the premier global competition for students who own and operate a business while attending college or university. Nominees compete against their peers from around the world in a series of local and/or national competitions in hopes to qualify for GSEA Finals. The GSEA represents more than 1,700 of the most prominent student entrepreneurs from more than 60 countries and brings global visibility to pioneering student business owners and their respective cities. Since 1987, the Entrepreneurs' Organization (EO) has been transforming the lives of the entrepreneurs who transform the world. A thought leader on entrepreneurship, EO is the only global network exclusively for entrepreneurs, with a business network of more than 13,000 business owners in more than 179 chapters and 57 countries. EO helps leading entrepreneurs learn and grow through peer-to-peer learning, once-in-a-lifetime experiences, and connections to experts. At the core of EO's mission is an unrelenting commitment to helping young and experienced entrepreneurs learn and grow on a personal and professional level. Along with GSEA, EO operates the EW Accelerator, a series of quarterly, high-impact learning events designed to provide top business tools, knowledge and skills needed to sustain growth and continued success. You can find more information, and apply to join at EONetwork.org. Everywhere Wireless owns and manages a Chicago-based Gigabit Internet Network designed for multi-family communities and businesses; clients include Cisco, CBS, Nike, Google, the Art Institute and the Field Museum, along with nearly all leading commercial and residential property developers, managers and condo associations throughout the greater Chicago area. Leveraging next-generation microwave technology, the Everywhere Wireless network delivers fiber optic Internet speeds up to and beyond 1,000 megabits per second (mbps), also known as Gigabit speeds, the fastest Internet available in Chicago as reported by Crain's Chicago Business. To help make a difference in the lives of the great people of Chicago, Everywhere Wireless has partnered with the City of Chicago to provide free Wi-Fi at many of the city's public parks and beaches – and the company regularly contributes to such community-focused organizations as the Alzheimer's Association's Greater Illinois Chapter, the ReVive Center for Housing and Healing and Literacy Works. For more information about Everywhere Wireless, visit EverywhereWireless.com.